The Global Volcanism Program has no activity reports for Itasy Volcanic Field. The Global Volcanism Program has no Weekly Reports available for Itasy Volcanic Field. The Global Volcanism Program has no Bulletin Reports available for Itasy Volcanic Field. The Itasy volcanic field in central Madagascar contains a diverse assemblage of volcanic landforms, including scoria cones, lava domes, and maars. Activity began in the Pliocene and has continued into the Holocene. Early eruptions produced trachytic lava domes and basanitic lava flows. Later activity produced trachytic lava flows and recent vulcanian eruptions. A trachytic maar was formed near Saovinandriana at the beginning of the Holocene, and several other crater lakes are present. Mild seismicity and thermal activity is present in the form of hot springs. Camus G, 1993. (pers. comm.). There is no Deformation History data available for Itasy Volcanic Field. There is no Emissions History data available for Itasy Volcanic Field. The Itasy volcanic field in central Madagascar lies west of Lake Itasy (lower-center) and consists of a N-S-trending chain of scoria cones, lava domes, and maars. 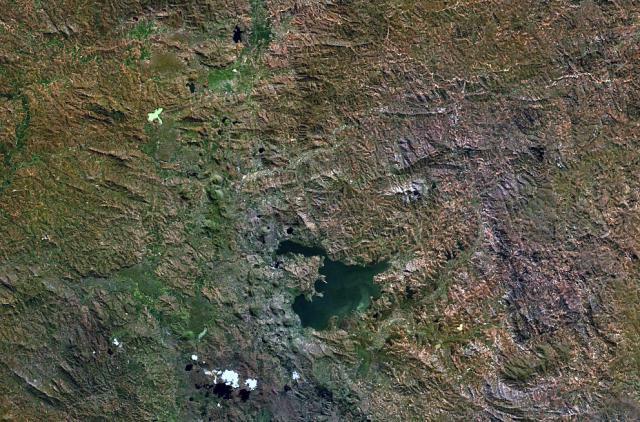 Several small dark-colored lake-filled maars can be seen in the NASA Landsat image (with north to the top), one of which lies just above the NW arm of Lake Itasy. Early eruptions producing trachytic lava domes and basanitic lava flows were followed by the effusion of trachytic lava flows and recent vulcanian eruptions. Mild seismicity and hot spring activity continue at Itasy. The Global Volcanism Program has no maps available for Itasy Volcanic Field. There are no samples for Itasy Volcanic Field in the Smithsonian's NMNH Department of Mineral Sciences Rock and Ore collection. Large Eruptions of Itasy Volcanic Field Information about large Quaternary eruptions (VEI >= 4) is cataloged in the Large Magnitude Explosive Volcanic Eruptions (LaMEVE) database of the Volcano Global Risk Identification and Analysis Project (VOGRIPA).